Irvine, Calif. – R.D. Olson Construction, a premier builder of hotel properties in California, proudly announces it completed construction on Homewood Suites by Hilton Irvine/John Wayne Airport, in close proximity to John Wayne Airport. The ground-up project marks the firm’s first partnership with Irvine-based hotel management and development company, DKN Hotels. The four-story, 161-room hotel is located in the heart of the Irvine business and industrial district, and minutes away from the shores of Newport Beach, Corona del Mar and Laguna Beach. The hotel also is close to premier Orange County shopping centers such as The District, South Coast Plaza and Fashion Island. Homewood Suites by Hilton Irvine/John Wayne Airport is the firm’s third completed project in Irvine, with the Irvine Spectrum Marriott currently underway. 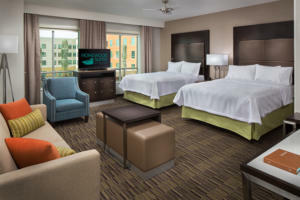 Homewood Suites by Hilton Irvine/John Wayne Airport gives nod to Orange County’s booming high-tech community with a modern, contemporary design that includes metal ceilings, smooth stone surfaces, and vibrant blue, green and orange colors in hotel accents and artwork. The open lobby features 30-foot ceilings and a convenient market for quick grab-and-go items. The hotel finishes are reminiscent of computer chips, graphic gaming imagery and abstractions, and lounge-like furnishings create a relaxing and home-like environment for business travelers. Managed by DKN Hotels, Homewood Suites by Hilton Irvine/John Wayne Airport features an array of business and public amenities such as a business center and more than 1,500 square feet of meeting space equipped with complimentary high-speed internet access, state-of-the-art audio visual equipment and natural lighting. The 126,000-square-foot hotel also boasts spacious studios and one- and two-bedroom suites with 42‑inch HDTVs and fully-equipped kitchens that include a full-size refrigerator, microwave, stove and dishwasher. The property’s outdoor amenities include a pool and spa, fire pit, BBQ grills and a sports court with options for basketball, volleyball, badminton and smashball. R.D. Olson Construction recently completed work on the 174-room Country Inns & Suites by Carlson in the Anaheim Resort District and the 200-room Residence Inn by Marriott hotel in Wailea, Maui, Hawaii, the first family-centric hotel in Wailea. Other recent completions include Paséa Hotel & Spa, a 250-room upscale boutique hotel in Huntington Beach, California, at the master-planned Pacific City project as well as the the 144-room Residence Inn by Marriott in Old Town Pasadena, California and the 94-room Hampton Inn & Suites in Glendale, California. The firm is currently building additional regional hospitality projects including the 130-room Lido House Hotel resort in Newport Beach, California; the 271-room full-service Irvine Spectrum Marriott in Irvine, California; and the 118-room Residence Inn by Marriott Santa Barbara/Goleta in Goleta, California. Lee & Sakahara Architects, Inc. served as the architectural firm for the project. SANDdesign was the interior design firm.